Added position cooldown (for building) after collecting or breaking a structure. This prevents the old 'trick' of instantaneously replacing structures when they're low on health. Light Torches now show their area of effect. Completely necessary to build your strategy! Lower drop rate for potions and power-ups. It just felt like a grocery shop before this! Collecting structures now restores half of its energy cost. Pretty convenient! Added air dash. Double-tap the direction keys while in mid-air to extend your jumps! Enemies' AI improved. No more 'all I do is attack the player' AI. 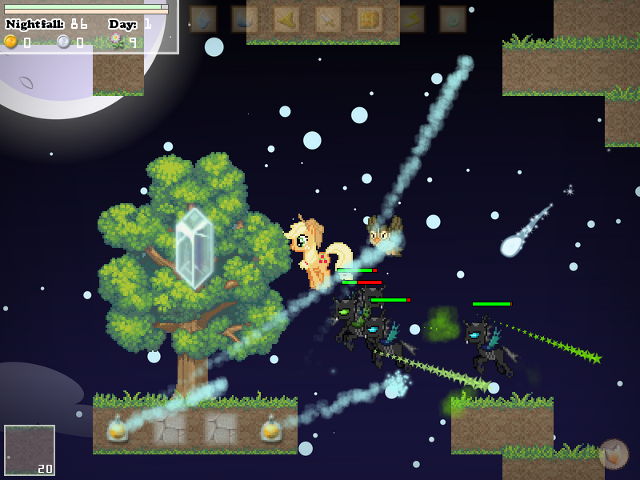 Shadowbolts and some bosses can now stun the player/mercenaries. You better be prepared! Items and structures can now be sold. Need some extra money? Check it out! 'Force night' option now gives some extra money in Normal mode. Forcing night is somewhat rewarding now! Creative mode now features double money gain. It's Creative mode after all. You don't lose lives anymore by falling off the map. Now you can be less worried while playing as a non-pegasi! Added 'Game speed' option (F5). Would you like to fast-forward? Or maybe slow things down a bit! Game is now slightly faster by default. It feels way more active! Added 5 seconds of invulnerability and invincibility after losing a life. Those 5 seconds can make a huge difference! Added Adventure mode (map 1). Explore the pre-made maps, collect the keys and find the exit! That's right, a whole new game mode for when you're tired of building! Added hard mode. For you crazy guys who want the game to be even harder. Added new skills and achievements. You gotta love Wave Attack! Greatly improved overall performance. This took its time, but I'm really glad to say the game's performance has been GREATLY improved. And I mean A LOT. The world now gets regenerated every 25 nights. I've had this idea for quite some time now. The whole world terrain gets re-generated after the 'big' bosses. Your stats, money and inventory don't change, though! Just the terrain and structures. You better start rebuilding before night falls again! Your attacks now bounce off structures. All of them. Other minor changes and bug fixes. And everytime I say this, I mean A LOT of minor changes. The red points are the changes since the last version of the Third beta (v3.94b), so those of you who have been following the blog will be most likely interested in those.